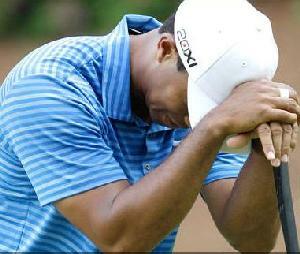 *Tiger Woods on Saturday did not look like someone who is going to win his fifth Masters title. He didn’t look like it on the scoreboard, where he is seven strokes behind. Or with his short game, which failed him with chipping on the front nine and putting on the back. The result was a sloppy 74, the worst third round of the top 13 scorers. He began the day tied for third and three back. He ended it tied for ninth and seven behind a 21-year-old, Rory McIlroy, who has a four-shot lead and appears on cruise control. Woods’ 2-over-par effort was surprising considering his nine-birdie 66 on Friday. But the retreat also was the continuation of inconsistency by someone who hasn’t been able to string together two or three good rounds since he last won in 2009. Read/learn more at Fox Sports. Y’all don’t want to sleep on Tiger. He had a sub par Saturday, but you know that he was going to come roaring back on the last day. Cosign. Tiger missed some pivotal shots over the weekend but he kept in the hunt. Hopefuuly he improves on his swings etc and he can get back to his winning ways because the media is trying to write him off and are heralding in a new crop of young contenders whic his okay competition is good but Tiger is too good to just fall by the wayside and not ever win major championships again. Yeah, include EUR in the media trying to write him off. At one point, he had a share of the lead, coming back from seven shots behind. If there was another round left, he could have won. Even though that Aussie really finished strong.